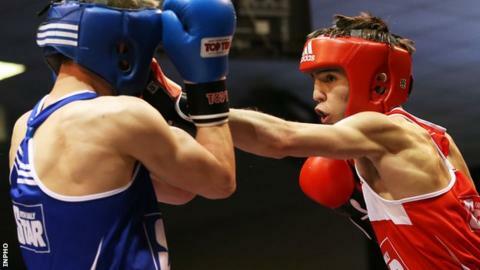 Olympic bronze medallist Michael Conlan won his third consecutive Irish Championship title by beating Chris Phelan in Friday's flyweight final. The Belfast boxer won all three rounds in outscoring his Kildare opponent 20-9 in Dublin. Conlan breezed through the first two rounds and his speed and superior footwork saw him comfortably home. There was further success for Belfast fighters as Sean McComb and Tommy McCarthy also secured Irish titles. Holy Trinity southpaw McComb won the lightweight title with a 19-7 win over George Bates of the St Mary's club in Dublin. McCarthy of the Oliver Plunkett club stopped Jimmy Sweeney of Drimnagh in the third round at the National Stadium. Michaela Walsh from Belfast won her fourth featherweight title with a narrow 6-5 victory over Joanna Lambe of Monaghan. Beijing silver medallist Ken Egan announced his retirement after suffering his third straight finals defeat to Joe Ward at light-heavyweight, taking a standing count en route to a 25-5 defeat. The 31-year-old Egan was bidding to become the first man to win 11 Irish senior titles and brought everything, but was simply outgunned by the sustained ferocity of an opponent 13 years his junior. A clattering combination set up an assault which wobbled Egan in the second and, although the veteran recovered admirably, Ward kept swinging in the big scoring shots until the final bell. Afterwards, Egan announced his retirement from the sport to a standing ovation, saying: "Joe is a big, strong lad and I am glad to be handing the mantle over to him." Taylor received a raucous reception at the arena which was filled to capacity. It was the start of a busy weekend for Taylor, who is scheduled to fight again in Dublin on Sunday as she builds up to her competitive return, which is likely to come at the EU Championships in Hungary in June.